A dental bridge is a fixed (non-removable) treatment option used to replace a missing tooth or teeth and is an alternative to dental implants or dentures. A dental bridge uses crowns connected together to literally ‘bridge’ the gap between two teeth. Crowns are placed on the teeth on either side of the space (“anchors”) as well as crowns used in between the anchors to fill in the space created by one or more missing teeth. Dental bridges are a popular treatment option to replace missing teeth because of their durability and natural-looking appearance. At Family Roots Dentistry, we like to think of teeth like books on a bookshelf. If you remove a book and do not replace it, the other books will tip and shift around. Similarly, when a tooth is removed and not replaced, the remaining teeth can tip and shift around. When teeth shift out of their normal position, this puts you at an increased risk for gum disease and bone loss as well as cavities. Teeth shifting can also cause an imbalance with your jaw joints, leading to discomfort as well as premature ‘wear and tear’ on your remaining teeth (including chipping or breaking teeth). WHAT ARE REASONS WHY A BRIDGE WOULD BE RECOMMENDED? 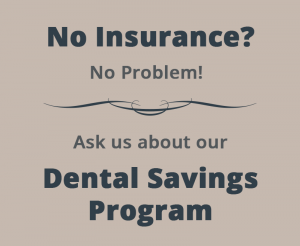 For more information or to schedule your appointment, please call us at (815) 318-0620 or contact us here.